JACKPOT. Of all the breakfast recipes I’ve ever made, this was by far the most popular. 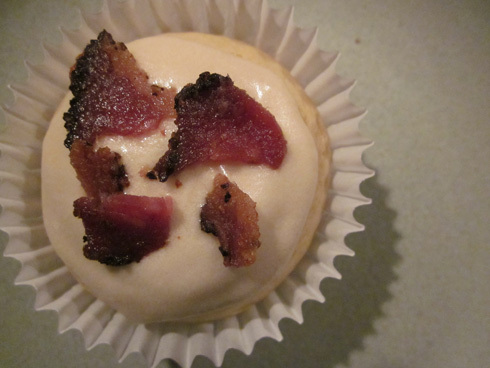 Of course, it is pretty hard to go wrong with pancake flavor, maple butter icing, and bacon. It started a few weeks ago when I had a conversation with my friend Jeremy about some delicious doughnuts he and Meghan had on vacation – maple long johns with a slice of bacon. Not able to stop thinking about the perfect combo, I decided to try to make something that had similar flavors, while also cutting out some of the calories. Instead of using a doughnut as the maple/bacon carrier, I decided to try a pancake muffin. I started with a recipe from Baked Bree (who said she started with a recipe from Bakerella), cut out a bunch of stuff and made it non-dairy. While I wanted all the flavor of a maple butter cream frosting, I did not want all of the calories. So, I made a lighter version that uses less fat, sugar, and has a touch of maple flavor. The result was more of an icing, easy to spread but not super thick. Then, topped it with some crumbled pepper bacon. Oh. My. Yes. BONUS: Less than 100 calories per serving. For real. Preheat oven to 350 degrees F. Line a muffin tin with cupcake liners and spray with cooking spray. In a small bowl, mix together 2/3 c. soy milk and cider vinegar, then set aside to curdle. In another bowl mix together flour, baking powder, baking soda, and salt. In a large bowl, mix egg, sugar, vanilla, and soy milk mixture. Then add flour mixture in two batches, mixing in-between. Divide batter into liners, they will be around half full. Bake for 18-20 minutes or until a toothpick comes out clean. Set on a rack to cool. While the muffins are baking, make the icing. In a large bowl, mix together margarine, maple syrup, vanilla and salt. Add half of the powdered sugar and mix. Add soy milk and mix. Add remaining powdered sugar and mix. When pancake muffins are cool, spread icing on each and top with crumbled bacon. – You can substitute dairy ingredients for the non-dairy counterparts in this recipe. If you’d like, you could use buttermilk in the pancake batter – simply use 2/3 c. buttermilk in place of the soy milk, then omit the cider vinegar. – If you do not eat meat or would prefer it without bacon, skip it (and remove six calories from each serving). And next time we’re at brunch together, sit next to me so I can have your bacon. How intriguing! Thanks for sharing this unique recipe. Thanks Daisy! Let me know if you give it a try.